The Wings PX1 PCIe x4 M.2 Adapter from Angelbird allows you to install a M.2 SSD in your system even if you don't have a M.2 slot by utilizing a PCIe x4 slot. It offers full, unrestricted performance for both NVMe and AHCI M.2 SSDs and is compatible with all M.2 form factors from 2230 to 22110. It comes with a heatsink and thermal pads to ensure your M.2 SSD is optimally cooled to deliver maximum results with no reduction or instability of throughput caused by poor or nonexistent thermal dissipation, bad data line signal integrity, or voltage fluctuations. Note: To receive the full limited manufacturer warranty, it is required to register and activate the product on the Angelbird Personal Service Portal within thirty (30) days after purchase. Connectivity PCIe Gen3 x4. Backwards compatible down to PCIe Gen1 x4. Box Dimensions (LxWxH) 9.9 x 7.7 x 1.5"
Wings PX1 PCIe x4 M.2 Adapter is rated 4.8 out of 5 by 17. Rated 5 out of 5 by jbro from High quality product You get what you pay for. This product was well packaged and included high quality hardware. It works well with the Samsung 950 PRO NVMe drive. I get over 2GB/s sequential read now... The only thing I didn't like was the white LEDs around the outside of the card, but it was easy enough to remove the zero ohm resistor on the board. It would have been better to have a jumper for this since many people don't have a soldering iron (or feel comfortable voiding the warranty on a brand-new product). Rated 4 out of 5 by LSL52 from Well designed, but pricey This PCIe x 4 adapter can accommodate a single M.2 form factor NVME drive. Although no instructions are provided in the box, assembly is easy and straight forward. When installed, LED lights are activated along the perimeter of the card -- otherwise this adapter functions much the same as lower priced ones. In most computer boxes, the LEDs would not be as much of a distraction as some reviewers have noted. What makes this adapter special, however, is the addition of a high quality heat sink that get screwed on so that it covers the entire surface of the card. The quality and machining of parts are excellent. Two pieces of thermal tape are provided to ensure effective heat transfer from the surface of the drive to the heatsink. One rating star was subtracted only because of its premium price. That said, I do not regret buying it. Rated 5 out of 5 by Gregory from High quality adapter! This is a very simple adapter as it is only routing PCIe lanes from the motherboard to the M.2 socket. But the mechanics of this adapter are well done. The heat-sink is precision machined and all necessary hardware is included. The mount bracket is perforated to help airflow. The white LEDs around the perimeter give the card a great look inside the chassis. Wish all electronics were made this well. Would recommend this product. Rated 5 out of 5 by Anonymous from Fantastic PCIe Adapter Upon unpacking you can tell right away this is a beautiful work of engineering. The machining and electronics assembly are state of the art. One of the best features of it is the heat sink and thermal pads. I bolted an SM951 to it. Previous to other manufacturers M.2 adapter boards this one kept the 951 from overheating and thus let it run at peak performance. It does take a bit of time to install as you have to remove the cover screws to place the M.2 card into its slot. Could be handy to have small fingers to get the nuts on. But well worth it for the heat sink. Another great feature is it passes Trim! Mounted in the number 3 slot of my Mac Pro 2010 all I had to do was enable Trim Force. The back of the PCIe cards has some bright LED's that shine through. I guess they just made it this way for the cool factor. Comes with a 10 year warranty so obviously the company feels good about it lasting! Rated 5 out of 5 by Patrick from Works perfect in X58 bios EVGA My X58 bios EVGA is old, very old. And it has the legacy PCIe 2 bus. Nevertheless, adapter works perfect using a SAMSUNG 7 250gb NVME SSD. WING heat shield works fine, high quality construction, pretty sure its not made in China. Samsung W7 driver required to use it. W7 Disk Management sees it fine. Much faster than the slower SATA SSD (when its not in Rapid Mode). NOTE: I did not try using it as boot drive; its used solely as scratch AVID video editing drive. Rated 4 out of 5 by Hoxlund from Keeps 950 pro cool It helps greatly in keeping the heat down on the 950 pro. But still after about 10 seconds of straight use. File transfers to/from can still throttle the drive. Brings speed from 2gb/s read down to 40-60mb/s. No fault of the angel bird product. Just 950pro is a beast and gets really hot. Rated 5 out of 5 by Charles C. from Angelbird Winhs PX1 PCIe x4 M.2 Adapter Works like a clock, fast like a rocket, the only comment i have are the bright white LED's, i had to cover them with a painters tape and they look awesome now cose they light up blue, i wish they had an option to control them via software, in RGB, other then that its a great Adapter if you want a reliable thin form factor adapter. Rated 5 out of 5 by Alexey from Wings PX1 PCIe x4 M.2 Adapter I just started to operate this thing, but the quality of workmanship and 10 years warranty speak volumes. I am pleased! 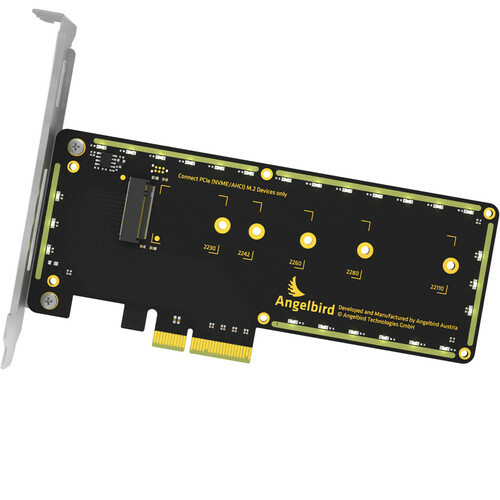 Why is the Angelbird Wings PX1 PCIe x4 M.2 Adapter [B&amp;H #ANWPX1 MFR #WIPX1-FWKF] discontinued? The Angelbird company has not given us this information. They can be reached at support@angelbird.com. is this compatible with the samsung 960 pro and help it run at max speed? I have not installed the pair yet. But I like what I see from others. A configuration checklist sounds in order P-2 Install. Will this adapter work with MyDigitalSSD BPX (240GB)? Well, I don't want to give you misinformation by saying the MyDigitalSSD will work. There is a compatibility list on the manufacturer's page for the PX1. Bear in mind, I think it would be impossible for them to test every single M.2 SSD for compatibility, but there is a good chance the MyDigitalSSD will in fact work just fine, since every M.2 SSD is built to a similar interface specification. Is this compatible with Sabertooth X79 Motherboard ASUS? I am not 100% sure. I am using it on a Z97 motherboard. It does not get the full use of NVME without being on a computer that knows how to deal with that. With this work with WD M.2 SSDs? it will work, but don,t expect a pci-e device to be seen as a boot device by your bios unless you have a new mother board.